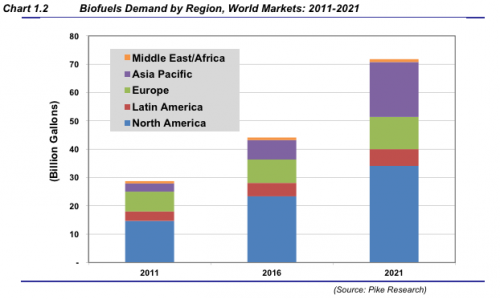 The new report, Biofuels Markets and Technologies, estimates steady growth though 2016 but rapid production increases between 2017 and 2021 as a result of higher oil prices, emerging mandates, new feedstock availability, and advanced technologies. 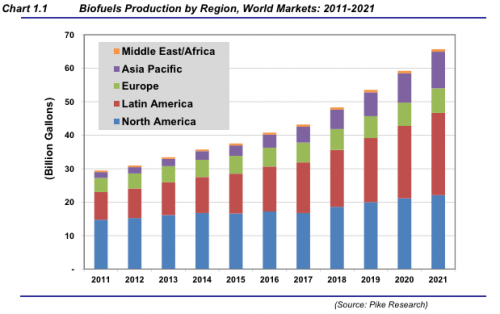 Total global biofuel production is projected to reach 65.7 billion gallons per year (BGPY) by 2021, and ethanol is expected to maintain its dominance over the industry, with nearly 50 BGPY compared to biodiesel’s 16.2 BGPY. The technological maturation of first-generation biofuel sources (such as corn, sugarcane, rapeseed and soy), combined with a second generation of fuel sources could increase production estimates even further. “The emergence of advanced conversion pathways and non-food feedstocks could unlock considerable production potential throughout the world,” says the report.